U2 were disappointed when they had to cancel this week's residency on NBC's The Tonight Show after Bono's shock cycling incident. But it seems like the frontman will be out of action for a lot longer than first thought as the full extent of his gruesome injuries has been revealed and it features a facial fracture, broken arm and shattered shoulder. Bono, 54, underwent five hours of reconstructive surgery on Sunday - which included three metal plates and 18 screws needed to repair the damage - after he was involved in a 'high energy bicycle accident' in New York City's Central Park. The singer was rushed to hospital where the worst of his injuries were found to be a 'facial fracture involving the orbit of his eye' and bone 'tearing through his skin,' it was later disclosed to Rolling Stone. The list also included a broken finger, multiple fractures to his shoulder blade and six fractures at the elbow on the same side of the body, following several X-rays and CAT scans. Orthopaedic trauma surgeon Dean Lorich, revealed: 'He was taken emergently to the operating room where the elbow was washed out and debrided. A second trip to the emergency room at New York Presbyterian/Weill Cornell Medical Center the following day saw Bono's little finger be reconstructed by surgeons. It was initially thought that the Vertigo singer had taken only a minor tumble in a 'cycling spill', whereas doctors are now saying he will need intensive and progressive therapy to make a full recovery. The avid cyclist is said to have tried to avoid another rider while travelling through the park and subsequently being thrown off his bike to the ground. The accident came just one day after he recorded the Band Aid 30 single with high profile artists One Direction and Ed Sheeran at London's Notting Hill studios. U2 was also set to perform a week-long residency on NBC's The Tonight Show Starring Jimmy Fallon starting on Monday night but have been forced to reschedule. The injury to the group's frontman was revealed in a note from Bono's bandmates The Edge, Adam Clayton and Larry Mullen Jr on the group's website that day. 'It looks like we will have to do our Tonight Show residency another time - we're one man down. Bono has injured his arm in a cycling spill in Central Park and requires some surgery to repair it,' the band's message said. 'We're sure he'll make a full recovery soon, so we'll be back! Much thanks to Jimmy Fallon and everyone at the show for their understanding,' it added. U2 in February treated fans to a rooftop performance during Fallon's first week of hosting The Tonight Show after he took over for longtime host Jay Leno. The Tonight Show announced the group's residency earlier this month and the bandmates were expected to take part in comedy skits on the late-night staple. The chat show was conducting a U2 lip sync contest to the group's new song The Miracle (Of Joey Ramone) from their latest album Songs Of Innocence. Participants who uploaded a video of themselves lip syncing the song could have their performance incorporated into a live performance with the band. Bono, real name Paul Hewson, was flying on a private plane last week in Germany that lost a hatch as it was coming in for a landing in Berlin after departing from Dublin. A Berlin airport spokesman said the rear hatch landed in the vicinity of Schoenefeld airport in the capital city's southeastern edge and the aircraft was never in danger of crashing. 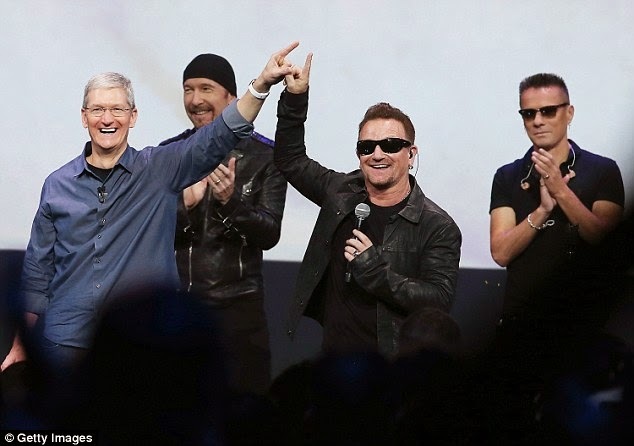 Bono apologised in October to iTunes users who objected to receiving an automatic download of Songs Of Innocence. U2 also was scheduled to perform on December 14 at The Forum in Inglewood, California during the second night of the KROQ Almost Acoustic Christmas concerts.